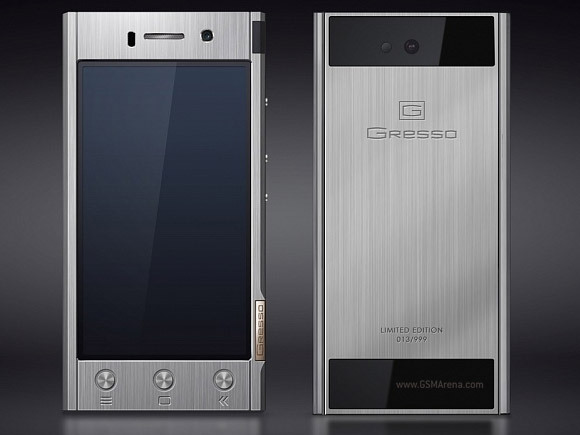 Luxury phone maker Gresso is jumping on the Android bandwagon with the Radical limited edition smartphone. The Gresso Radical R1 is made of grade 5 titanium that is milled by high-tech machines for nine hours. The body is then handed off to someone to manually polish for 4 hours straight, resulting in the attractive texture on the phone's back. The back of the phone features Gorilla Glass insets that are tinted black using a special process. More impressively, the capacitive keys on the front of the Radical R1 are part of the aluminum unibody, a unique design developed by Gresso. There's a manually polished Gresso logo that's made of titanium on the base phone, yellow or white gold on the higher-end model. The phone measures 138 х 69 х 12 mm and weighs. Its smartphone credentials are a 4.5" touchscreen of qHD resolution (245ppi), Android 4.1.2 Jelly Bean, a quad-core 1.2GHz processor (no word on the core design but Cortex-A7 is likely), 8MP camera with 1080p video capture and 36GB of built-in storage. Surprisingly, the Gresso Radical R1 is a dual-SIM phone. Perhaps not that surprising, considering the base model costs $1,800. The gold logo will set you back another $500. A premium presentation of the device will be held at CES in Las Vegas early next year. Keep in mind it's a limited edition and only 999 units will be made. You can find out more about the Gresso Radical here.